My name is John Heinz. I'm a lifelong animal lover and longtime pet caregiver, with a specialty in handling dogs of all breeds and sizes as well as domesticated birds. My approach to pet care is one of thoughtfulness, individualized attention, patience, and flexibility. Every animal, not to mention client, is different—what works for one may not work for another. As a member of the ASPCA and other national and local rescue organizations, I've been lucky over the years to adopt, foster, and help rehabilitate animals of various ages, constitutions, and temperaments. 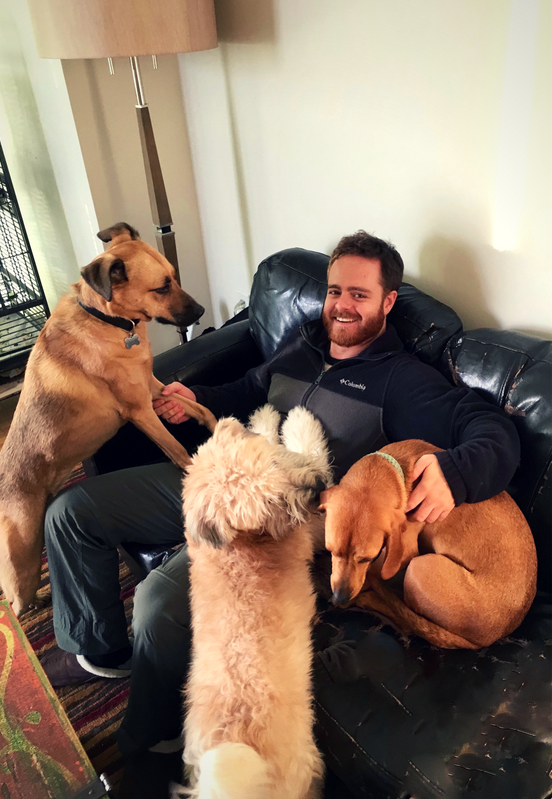 Today these include Murphy, a 10-year-old German shepherd mix, and Byron, a 28-year-old African grey parrot—the pets who have lent my business its name. They mean everything in the world to me, so I understand just how much yours means to you. As owner and proprietor of my small business, I treat every guest like a member of my own family: that's the Shepherd and Grey promise. have a question? contact shepherd and grey.